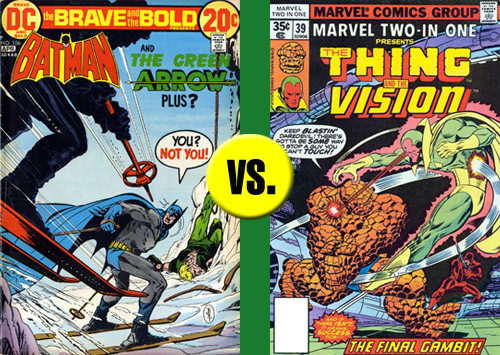 In the black corner... it's Batman and Green Arrow, written by Bob Haney and drawn by Jim Aparo, Brave and the Bold #106, Double Your Money -- and Die! In the orange corner... we have the Thing and the Vision, written by Roger Slifer, and drawn by Ron Wilson and Pablo Marcos, Marvel Two-in-One #39, The Vision Gambit. Batman is Batman, deep diving into the Stygian waters of Gotham River (it really is hell there) to get a dead body out of a car wreck, playing fireman at the retired actors' home, breaking up illegal casinos, flip talkin' check check check in the Bob Haney manner, and generally being a good detective while most everyone else just cannot be bothered to believe the deaths of shareholders in the trust fund of a socialite could be anything but a coincidence. 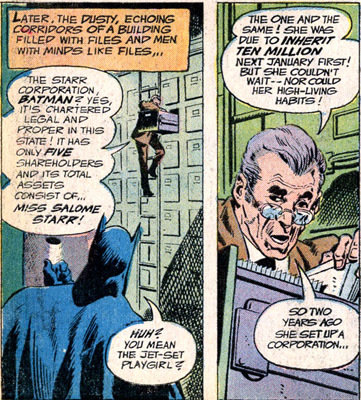 Commissioner Gordon is especially incompetent. 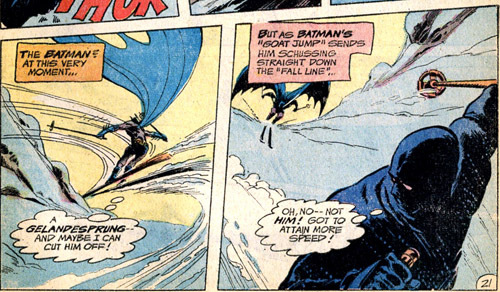 And you know what, Batman's a Bond-level skier too. 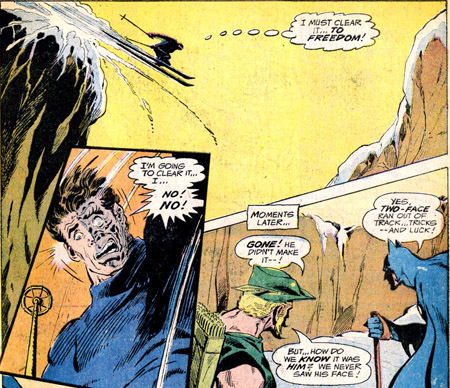 He and his guest star go skiing for about a week as Gotham and Star City fall apart, but what else can you do? 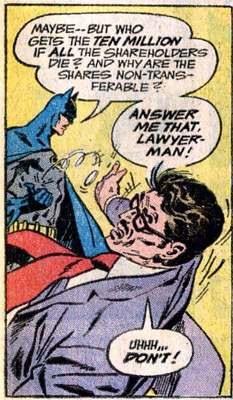 The one thing Bats ISN'T particularly good at is air traffic conducting. When we last saw the Thing, he'd been gassed by the Mad Thinker and was helpless to save Daredevil from indentured servitude. In THIS issue, he lets himself be hypnotized by the Thinker and spends most of the story thinking the villain is a pretty cool dude actually (he MAY have been primed to like mad scientists by Reed Richards, I'll admit). 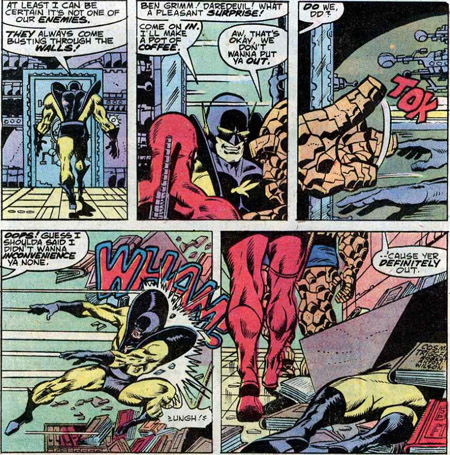 Off he goes on a mission to steal the Vision from Avengers Mansion, and it won't be Yellowjacket who'll stand in his way! Looks like Green Arrow is a sucker for "way-out investments" and bought one of the five coins/shares that could double the million it cost him. He's on the "it's all a coincidence" train too, a train that almost gets him run over. 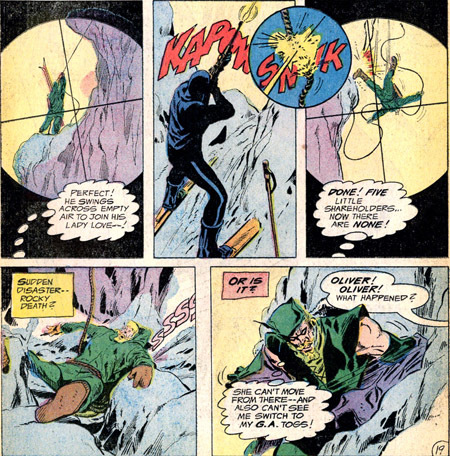 After learning his lesson, he's soon on a ski trip in Switzerland with Bruce Wayne and socialite Salome Starr, his secret identity protected by an inflatable Oliver Queen dummy that can "take the fall" for him. DD massaging YJ on pressure points to make him come to. Switching costumes. Filling Yellowjacket's uniform with form-fitting ants. Hiding inside a super-illuminated casket, turning a weakness into a strength. Hank even de-hypnotizes Ben in time for the final round of punching. 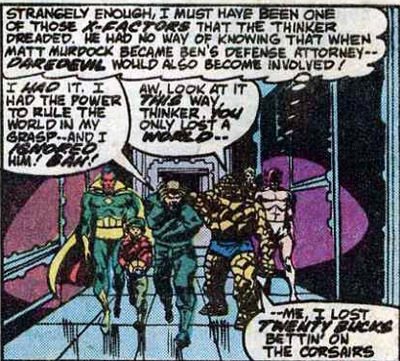 Not so great is Daredevil trying to convince himself maybe he IS psychic like the Thinker believes, and of course Hank getting the crap beat out of him in every encounter. 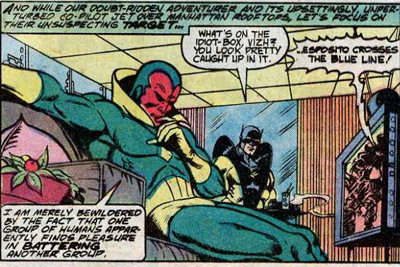 Meanwhile the Vision is the Mad Thinker's object of affection - he's an android expert, so that has to count for something - and makes up fo his defeat by disintegrating his lesser cousins with his optic blasts. All in all, I think the guest stars deserve +9 points. Two-Face only unmasks at the end, but he was playing the long game, posing as a lawyer who convinced an impatient socialite to sell her 10 million dollar trust fun to 5 millionaires for half the price, on the condition the coin-share was nontransferable, but in the advent of all their deaths, would go to a Swiss plastic surgery clinic to pay for his face. Uhm. 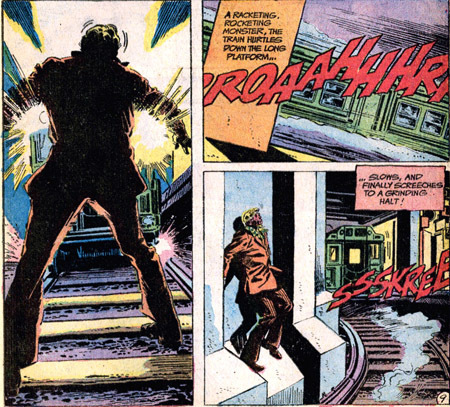 Well, he does manage to trip Green Arrow in the subway without getting caught. He did arrange for various accidents that snowed (ha!) the police, including firing an avalanche cannon at a helicopter, and he's a real good biatholonist too. 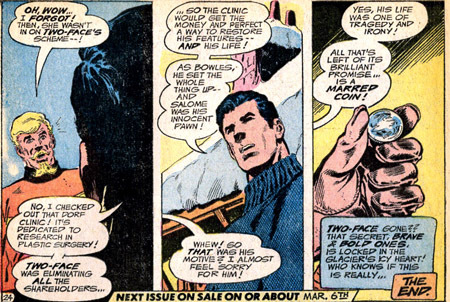 On the minus side, Harvey gives himself away when Batman flips a coin at him and he FREAKS OUT! Haney kills him at the end, making him ski into a ravine. Batman estimates it'll take 20 years before the glacier melts and we can send someone to check on the body. 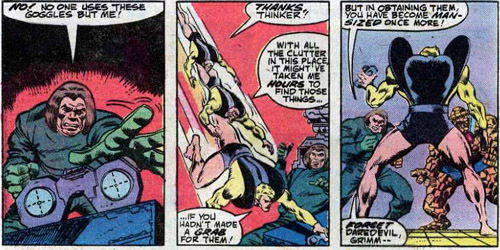 The Mad Thinker is still under the mistaken impression that Daredevil is psychic because his psychic computer told him so. Now that he HAS a psychic, what he really wants is a Vision (oh, I get it!) so he can improve his fake-Vision army. Points for having all the tech required to make heroes do his bidding AND nullify Vision's abilities, but points off for being wrong, wrong, wrong in his initial premise. -Except for the supers, the Marvel Universe is our world, right? So who are these hockey teams the Vision is watching on TV, and on which Ben Grimm has bet? 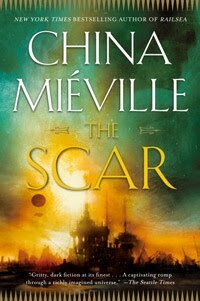 The Hornets and the Corsairs?! Are New Yorkers really into what sounds like junior high teams? I feel bad for the Rangers and Islanders, and I NEVER feel bad for those guys. I used to love this feature! It was great to see it again, even if it isn't going to be a regular event. Thank you! I love writing it too, but it's hard to keep the fight going sometimes on account of the length. As soon as you have too little time to write it, it goes into hiatus.